Discussion in 'The Small Company Luthiers' started by mikealpine, Apr 26, 2016. Hey all, much of what I read about a T-style's distinctive sound comes from the bridge, yet I see that the Anderson T-style guitars don't have the same style bridge. How does this impact the tone? Do you still get a Telecaster sound out of these, or are they completely their own voice? It seems like a naïve question, and I apologize for that, but I've been looking at boutique T's, and the Anderson models look amazing, and with the contours, look like they'd be very comfortable. I played a non-T style, and the work on the neck was amazing. 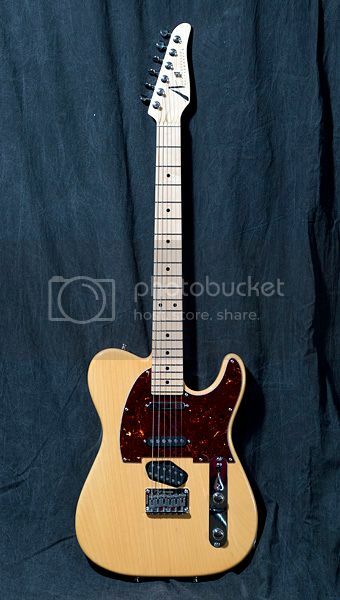 So really curious how the lack of a somewhat traditional Tele bridge affects an Anderson T-style guitar. It isn't the individual saddles vs. the three-saddle design that I am asking about. On a Tele, most often I see the metal plate surround the bridge pickup. On an Anderson, there is no metal plate around the pickup. I had a Strat that was wired to get bridge/neck, and I received a lot of comments that you won't get the Tele bridge-neck tone out of a Strat because the bridge design is totally different, even if I had a Tele bridge pickup there. With additional questioning, I was told it's the whole bridge assembly, including the metal around the pickup. Am I way off base? Unfortunately, on Long Island, there aren't any Anderson dealers, so I can't walk in and try a variety to get a better understanding through playing. And I can see why Anderson guitars have such a following. The craftsmanship of the guitar I played was impeccable, and the sound was awesome. I wasn't looking for that style guitar, but if I was...what a stunner! I used to own a wonderful TAG T and it sounded every bit like a Tele as any of my Teles with the ashtray bridge. You'll also see an awful lot of Nashville players, including Pete Anderson (Dwight Yoakum), playing Anderson Ts. IMHO, Anderson builds a fantastic T and the bridge does not negatively effect the Tele tone. That said, if you want an equally amazing T type but with a more traditional bridge, you owe it to yourself to look at Suhr. the iconoclast, Paleolith54, Cal Webway and 2 others like this. You can't get as much twang from a TA. It's not a bad thing, just different. A tele with a pickup mounted to a ferrous metal bridge plate is going to sound different than one with no plate and the bridge pickup screwed directly to the body. There's a little background on Tom's tele style guitars on page 2 of this interview. Worth a read. Actually, for what I play, it's a very good thing. I play mostly modern country and classic rock when I'm with the band, and more mellow rock (folk rock?) when I'm on my own. And I venture into blues leads, or at least I try to get better at that, anyway. So heavy twang isn't what I am after. I'm probably more in the P90 camp, really clear and powerful, but not piercing on the bridge, smooth-and-clear on the neck. I could probably get by with a single P90 and play with the tone control. I'm too chicken to buy a guitar like that, though, thinking I'm not going to get enough tonal range to play our entire set list, and in reality I could probably get away with it. 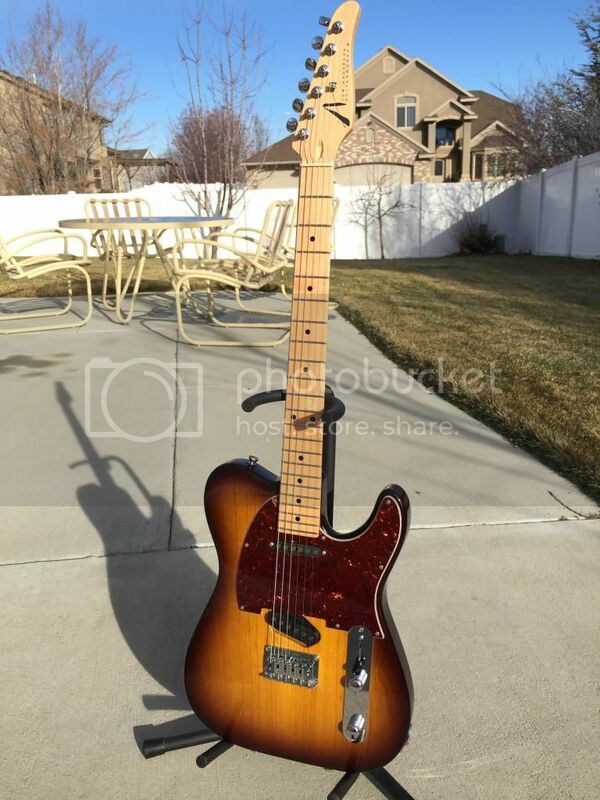 I strayed from the point...so if it resembles a Tele, with less twang overall, it sounds like it's a good fit for me. Thank you for this. The Short T sounds like it would be a great instrument for me. I'm 5' 5" tall, and 53 years old. I can still play a "standard" scale instrument, but a shorter scale is certainly more comfortable. I like the idea of 11 gauge strings feeling more like 10s. Good read, as you said. I have a short Hollow T Classic. It is feather weight, sounds great, plays wonderfully. It's my main gig guitar because it is so comfortable on the shoulder over the course of three or four sets. FWIW, my hollow T's body was so lightweight that the guitar had pretty bad neck dive...bad enough that I had to add more weight (trem blocks) to my strap at the bottom strap button to make it feel more comfortable which kind of defeated the purpose. This hollow T also didn't have as tight a bottom as my solid Ts. As a result, I'd never buy another hollow 25.5" scale T again. A short T "might" be different, if that floats your boat, but at 6'4" the long scale solid body fits me better. Thanks for the hint on neck dive. Didn't think about that. I have a Vox HDC-77 semi-hollow that does that, and I play it with a lightly weighted strap. The guitar is so light, and the strap evenly distributes the weight, so it's not a big issue, though perhaps a short solid T would be a better option? Not sure if that's made, but I will keep my eyes open. I'm good with anything 8 or 9 pounds, so it's not the weight, it's the total length. I'm also very trim, and need a belly carve or guitars tend to leave bruises on my ribs if I stand with them for a full gig. Mine is not neck heavy fwiw. And solid is an option. If you're ok with an 8-9 lb. guitar, I'd go with solid body with contours (which will lighten up the guitar a little in addition to the comfort factor). Then you have no concerns over neck dive nor concerns over how a hollowed T's tone is effected. After trying the TAG hollow T and a Tyler hollow S, I've sworn off of hollow guitars...in my experience, hollow guitars do not have the same note definition of solid. Interesting, I'm the other side of this. I have a hollow Short T from TAG and a hollow SE Retro Tyler, both amazing. I don't think they are great for heavy metal but for rock/blues/funky/classic rock stuff, they are great. I think 5 people I'm aware of have bought a Tyler or TAG after playing these 2 fiddles. On the neck dive situation, none at all on the Tyler, but the TAG does have a bit of neck dive, I use my most scratched up strap to hold it better in place on my shoulder/back. Yea, a hollow T is always going to have worse issues with neck dive than an S as a result of the placement of the top strap button. My hollow Tyler hung and played great but sounded like wet farts...no note definition whatsoever. Strange. My TAG hollow T classic (2003) doesn't dive in any significant way. The short variant would of course be even less neck-heavy, but the shorter scale does affect tone. The string tension of the 25.5" scale is an important factor to the traditional tele sound. The bridge OTOH is less important from what I have experienced. I've been experimenting with different bridges and pickups on a tele I've assembled myself and found that the base-plate under a tele-style bridge pickup does contribute to the tele-sound, but the bridge metal plate surrounding the pickup has little if any effect at all. The Anderson T bridge-pickup does have a base-plate. The T3 that is the most common bridge-pickup on Andersons teles is slightly hotter than an old classic, but nothing that you IMHO can't compensate with a slight gain adjustment. I love mine. It is my first foray into T style guitars. I may not play traditional tele style music but I love it. Mine is a short T.
My Anderson T has no problems sounding like a tele whatsoever. The one reason why I won't buy an Anderson T. IMHO, the tele bridge plate is absolutely necessary.